A small, single-storey, stone cottage, dating from 1686, on Silsden Road in Addingham, is said to have originally been used as a poorhouse. It originally had just two rooms, with its water taken from the nearby beck. It was inhabited until around 1910, then subsequently used as a practice venue by the village band, thus becoming known as the "Band 'Ole". The previously derelict building has recently (2009) been refurbished and extended. 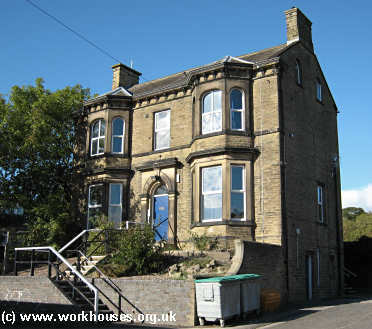 Addingham former poorhouse (left end of building), 2009. In 1777, a parliamentary report recorded workhouses in operation at Skipton (for up to 40 inmates), Grassington (22), and Kettlewell (20). 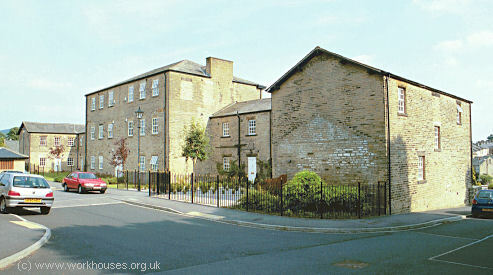 Skipton's workhouse was located near the junction of Brook Street and Broughton Road, next to Eller Beck. In 1795, it housed just 8 inmates under the charge of a matron. The site was later occipied by the dye house for Dewhurst's cotton works. 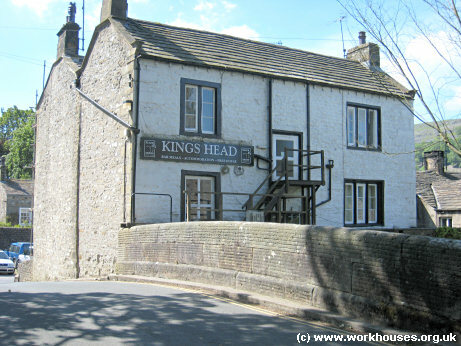 The King's Head pub in Kettlewell is said to have at one time been the village's workhouse. Kettlewell former parish workhouse, 2010. West Riding of Yorkshire: Addingham, Appletreewick, Bank Newton, Barden, Barnoldswick, Bolton Abbey, Bradleys Both, Bracewell, Brogden with Admergill, Broughton with Elslack, Buckden, Burnsall with Thorpe, Calton, Carlton, Coates, Cold Coniston, Conistone with Kilnsay, Cracoe, Draughton, East Halton, Embsay with Eastby, Eshton, Farnhill with Cononley, Flasby with Winterburn, Gargrave, Glusburn, Grassington, Hartlington, Hazlewood with Storiths, Hebden, Hetton with Bordley, Kettlewell with Starbotton, Kildwick, Linton, Marton Both, Rilston, Salterforth, Skipton (3), Stirton with Thorlby, Thornton, Threshfield. Later Additions: Beamsley (from 1869), Cowling (from c.1838), Earby (from 1909), Silsden (from 1861). The population falling within the union at the 1831 census had been 25,283 with parishes ranging in size from Calton (population 79) to Skipton itself (4,181). 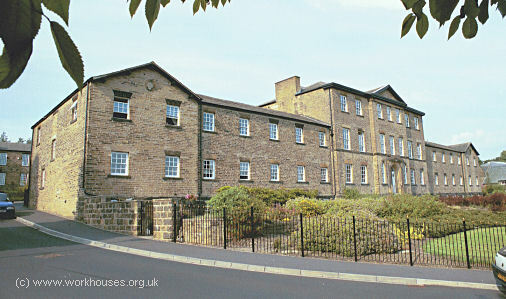 A new Skipton Union workhouse was erected in 1838-40 at the north side of Gargrave Road in Skipton. In 1839, the Poor Law Commissioners authorised an expenditure of £4,000 on construction of the building which was to accommodate 200 inmates. The design of the building appears to be a modified form of the model "square" design published by the Commissioners in 1835, and lacked two of the normal four wings giving it more of an H-shaped layout. The south range of the main block contained male accommodation at the west and female at the east. The range running northwards to the centre contained the dining-hall and kitchen which then connected to an octagonal hub where the Master's quarters were located. The northern range may have house children or the infirm. The original layout is shown on the 1850 map below. Between 1852 and 1870, a small infirmary or fever hospital and a laundry were built to the north of the main workhouse. An arched entrance block containing the porter's lodge was added at the south of the site. The workhouse location and layout are shown on the 1890 map below. Skipton main block from the south-west, 2000. Skipton rear of main block from the north-west, 2000. The old infirmary block was later used as a nurses' home. 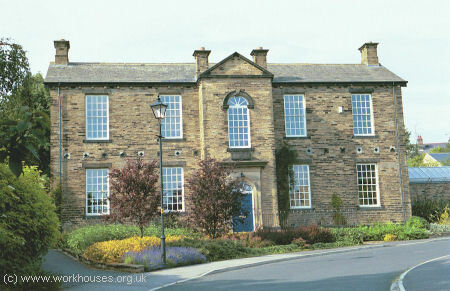 Skipton old infirmary block from the south, 2000. Later additions to the site included a 48-bed infirmary in 1900 at the north of the site (replacing the laundry), and male and female vagrants' blocks respectively at the east and west of the porter's lodge. 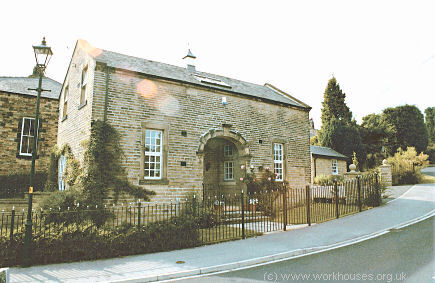 Skipton former female vagrants' ward, 2000. Skipton had a reputation as being rather more humane than many other workhouses. In 1852, a local man named Benson Bailey wrote of the "cleanliness, comfort and cheerfulness" of the inmates. The elderly received a tobacco allowance, and in 1871 an excursion to Morecambe was provided for the workhouse children. From 1904, to protect them from disadvantage in later life, the birth certificates for those born in the workhouse gave its address just as 16 Gargrave Road, Skipton. In 1930, control of the workhouse site passed to the West Riding County Council. A plan from that time shows the layout of the buildings. The site had expanded a little way to the north providing space for gardens and for piggeries were located at the far north-west corner. Under its new management, the establishment was redesignated as a Public Assistance Institution, with the infirmary being enlarged and a new nurses' home being erected. Children were transferred to the nearby County Children's Home. The site later became Raikeswood Hospital. The male vagrants' ward was demolished in about 1958, and the lodge in 1971. Since the closure of the hospital in around 1990 the site has been redeveloped for residential use. Skipton from the south-west, 2000. 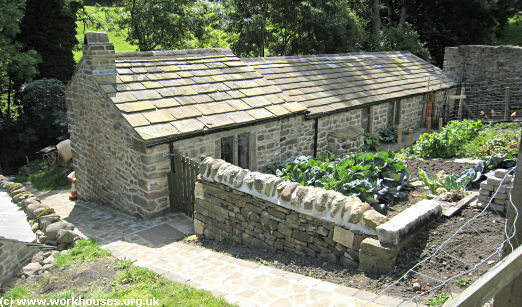 By the 1920s, the union was housing children away from the workhouse at a 'cottage home' on Broghton Road, Skipton. The proprety, known as Aireview House, could house up to twenty children. North Yorkshire County Record Office, Malpas Road, Northallerton DL7 8TB. Holdings include: Guardians' minutes (1906-30, with gaps). Skipton Library, High Street, Skipton BD23 1JX. Holds an assortment of twentieth century records.